Way back in 1969 as Forest Ranger here I spent a couple of weeks aboard the Otago Universities Marine Research Vessel “Munida” down in Port Pegasus. There were a variety of disciplines on the expedition, and my job was field manager. I remember my Forest Service boss telling me to keep an eye out for Fiordland Crested Penguins, as they were reputed to be starting to nest down there. I spent several evenings staking out beaches, hoping to see them coming ashore in the evenings, but without success. I left the job shortly afterwards and became a commercial Fisherman, initially out of Breaksea Sound in Fiordland. There we quite regularly saw Fiordland Crested, and also remember Fisherman from around the Island reporting seeing them occasionally in Port Pegasus, and also around Codfish Island. By the late ’70’s I had moved my fishing to day work out of Halfmoon Bay and occasionally would take out birders while I was fishing … great way to see pelagics !! 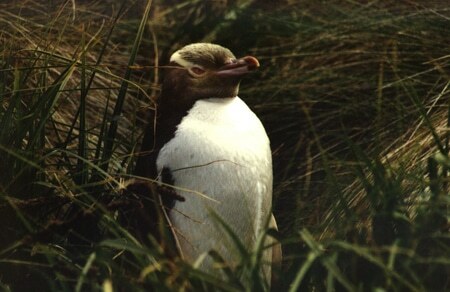 … A French couple with me swore black and blue they had seen a Fiordland Crested just south of Bench Island, but I couldn’t find it, and was frankly disbelieving, thinking they had probably seen a Yellow Eyed Penguin. But in hindsight I think they were correct, and I was wrong, as since then Fiordlands have slowly established around the local coast, and perhaps that was one of the first. Just before Christmas I came across a raft of maybe 20 birds fishing south of Bench Island, and today we saw a Fiordland Crested maybe a year old and just out of the molt at the Ulva Landing. And in fact I’ve seen far more Fiordland Crested Penguins than I have Yellow Eyed Penguins. Yellow Eyed numbers are declining rapidly, for reasons the researchers are unable to explain, and a once numerous bird is now a comparative rarity. It’s very sad, although it is great to see their cousins doing so well.